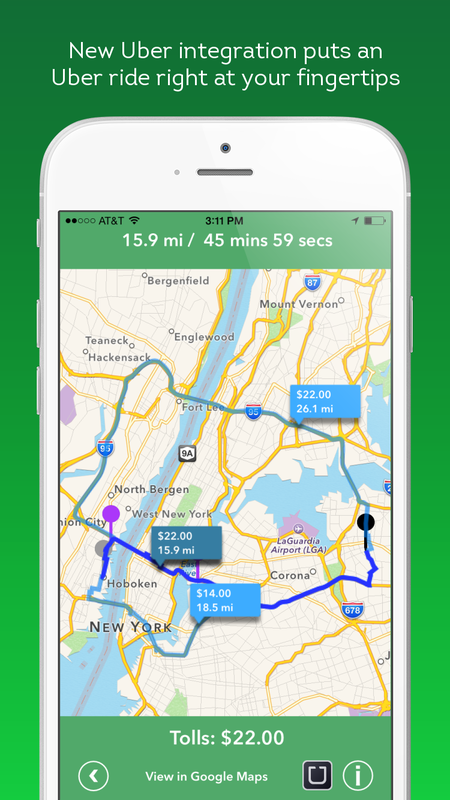 Hot on the heels of last week’s exciting news about our partnership with Urgent.ly and just in time for the July 4th holiday weekend, the team at Tollsmart is thrilled to announce we’ve integrated another innovative service into the newest version of our Tollsmart for iPhone/iPad app; UberX. 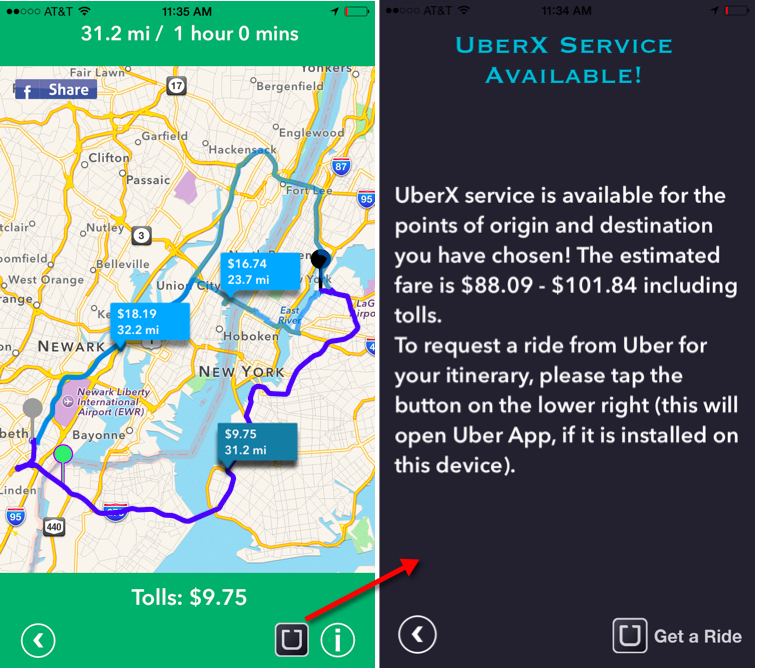 Tollsmart users now have the ability to see when an UberX ride is available for the route they entered along with the fare estimate and detailed toll information. It’s Uber, but with tolls! Additionally, If the user has unlocked the Alternate Routes feature in Tollsmart, he or she will have the added benefit of being able to compare UberX fares across as many as three route options, making it easy to recommend the most cost-effective. The integration was completed as part of an Uber hackathon we participated in earlier this year that was conducted by ChallengPost, and which coincided with the release of some new Uber API services. 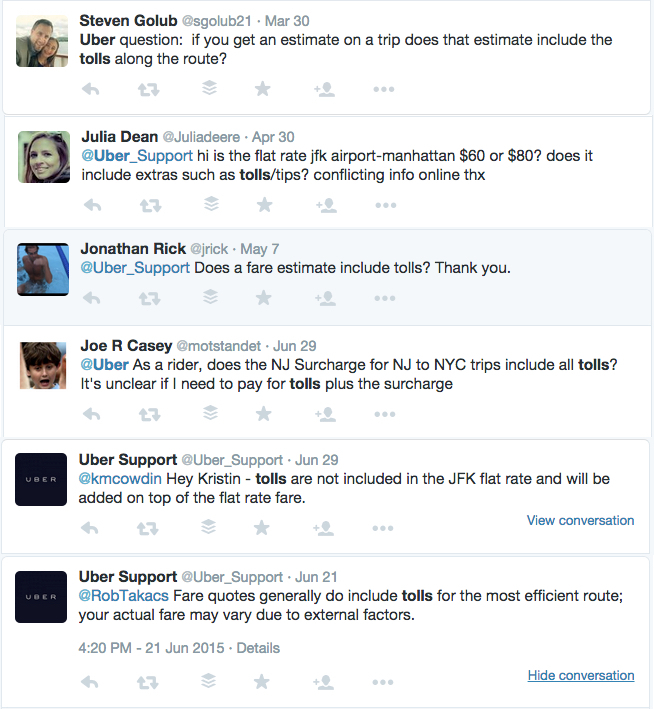 We jumped at the opportunity to mash up the Uber fare estimates with our toll data as we’d noticed many people posting questions on Twitter regarding whether or not tolls are included in Uber fare estimates (Uber Support confirmed that tolls are included in fare estimates, with the exception of flat rate pricing to places like Airports – see below). 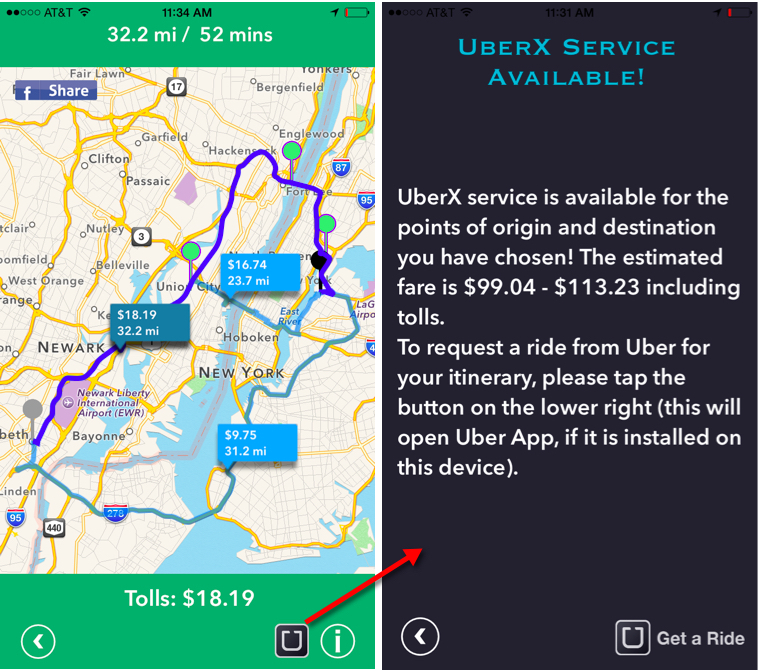 We also wanted to make Tollsmart users aware when an UberX ride is available as an option to get to their destination, and show them the fare estimates within the Tollsmart app so they can easily make a decision as to whether to opt for an Uber. The new Uber fare estimate feature is currently only available on the iOS version of the Tollsmart app, and here’s how it works. 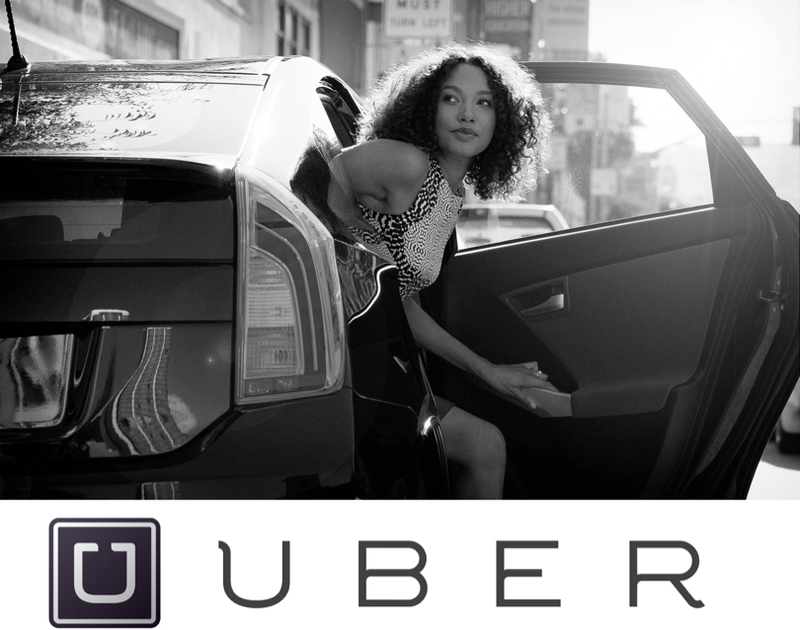 When you enter a route where UberX provides service, the Uber logo will appear at the bottom of your screen. Tapping on the logo will display a screen with the Uber fare estimate along with a button to Get a Ride (see below). If you have the Uber app on your phone, tapping the Get a Ride button will open the app, defaulted to the origin of your route. If you’ve unlocked the Alternate Route feature on Tollsmart (allowing you to view multiple route options) you can view the fare estimate for another route simply by tapping on the desired route on the map which will highlight it. This will also display the time and distance for the selected route at the top of the screen, and then tapping on the Uber logo will display the fare estimate for the alternate route. You’ll note that in this example the alternate route takes an estimated 8 minutes longer than the fastest route but could save up $14 in toll costs and Uber fees. We’re super excited to introduce this new feature to our users as it advances our mission of making everyone smarter about tolls – including Uber riders. But it also demonstrates just one example of how our upcoming API service can begin addressing new problems being created as a result of the explosion of the sharing economy, and we believe there will be many, many more. The above example demonstrates how a prospective UberX rider could benefit from this new feature, but what about the UberX driver? As more and more people begin using their own personal assets such as cars to generate additional income they’ll need new tools to help them assess things like driving costs to ensure they’re pricing their services effectively and, where possible, recouping those costs. At Tollsmart we sense a burgeoning need for a new toolset for the sharing economy tied to driving costs, one where Tollsmart is extremely well-positioned to add a great deal of value. We’ll share more thoughts on this in a future post, meanwhile if you have an iPhone or an iPad download the latest version of Tollsmart for iOS here and try out our newest feature and let us know what you think. Want to save the $2.99 retail price? As a special July 4th promotion we’re giving away 50 free promo codes to download the app for free – first come, first serve. Just hit us up at feedback@tollsmart.com and we’ll email you back with the code. This entry was posted in Calculator, Commute, Google Maps, iphone app, mobile app, navigation app, Tolls, Uncategorized and tagged getaround, lyft, rideshare, sharing economy, toll calculator, uber, zipcar. Bookmark the permalink.